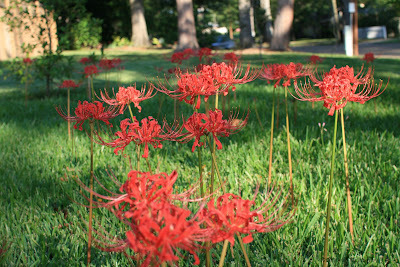 Dig, Grow, Compost, Blog: Save the spider lilies! Last week I received a phone call from a friend who lives down the street. She was livid because the mower she hires to mow her two yards had mowed down her spider lilies which were in full bloom. She said she warned him about them last year but apparently he forgot and thought she wanted them mowed. Hmm...! So since I use the same mower (getting old means you do things like hire mowers), I was a little nervous that I would oversleep this morning and my spider lilies would suffer the same fate as my friend's. (The mower arrives almost before the proverbial chickens get up.) But when he arrived I was awake, probably because I was fretting about them. I quickly dressed, ran outside, and made sure he understood that no, spider lilies were not for mowing. (And reminded him once again that my shrubs and small trees should not suffer the weed whacker.) And this afternoon, as the sun was setting, I captured the lovely little lilies which insist on growing in a lawn of all places. Whew! I'm glad you were able to save them from the eager mower. Isn't it funny what those guys will cut down? Or, rather, not funny but aggravating? Wow, that was a close call, you had me quite worried. I too am glad you were able to save those lilies. What kind of person would cut those down, anyway? Sigh.